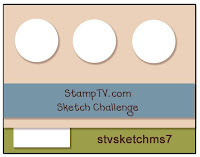 I did get the third entry for the CHA Envy Challenge into Stamp TV in time. I wanted to share my entry that I posted on STV. 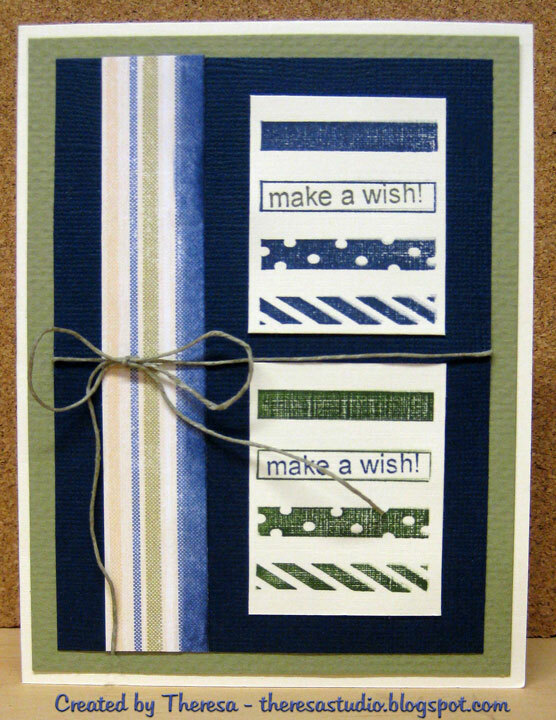 Melanie's challenge was to choose your own challenge: either do a color challenge with the colors in this card: navy, olive and ivory or use DP and try to recreate or echo the pattern from your DP with your stamping. For a double entry do BOTH on your card, using these three colors and the DP challenge! Did not use much of the DP but just enough to show the stripes. I of course I chose the hard way and tried to do both. It took me longer to figure out what to do than actually the time to make a card. I used a striped DP and tried to echo the stripes in my card. Stamps: GKD "Candle on Your Cake" by Melanie...used the candles to stamp stripes and stamped sentiment in the open candle. Finished all 3 challenges in the CHA Envy at STV. There are so many wonderful challenges in blogland and I can not do them all, but I have my faves.. 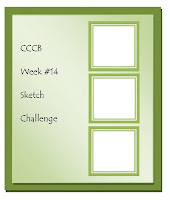 I love the Waltzingmouse Sketch Challenge and never seem to have time to do it since I try to do in some sort of chronological order working thru the week....this week I am starting with this challenge that just came out this morning and working in ...I don't know what order. At least I am not rushing to post this one. Waltzingmouse Sketch Challenge: Shown to the right. I also tied this into a challenge at Stamp TV ...some of the staff added some challenges called CHA Envy for those who are not able to attend the CHA Convention (Craft and Hobby Association) in Chicago. 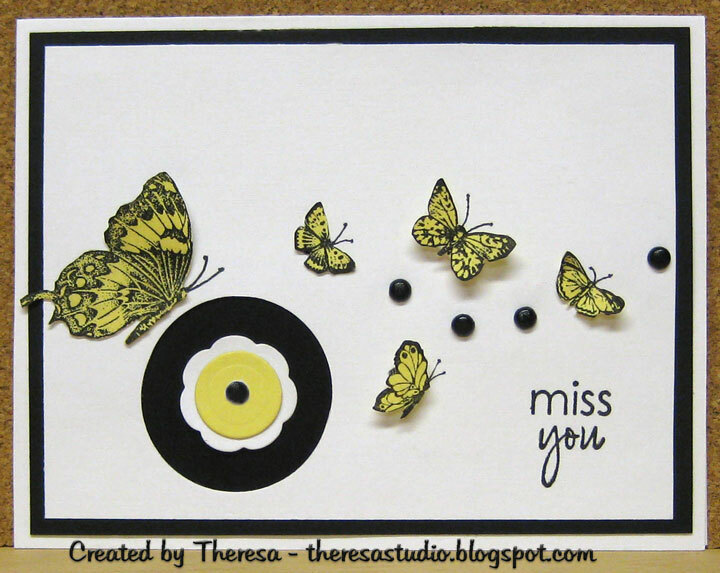 Entering also in Stamp TV's CHA Envy 2: Make a card using Yellow & Black as the main colors. There is one more challenge I need to do out of 3. Will see??? Stamps: Butterflies are some old foam back stamps that are very Old. May be back with one more today! 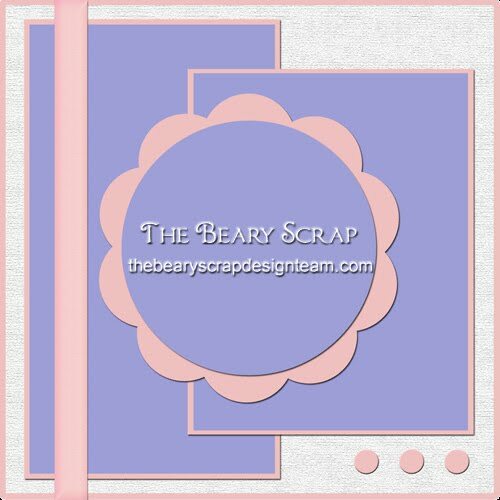 Just Cute Bears challenge is to make project with only the "Bear" Necessities and to make it clean and simple. This is sometimes harder to do than it sounds. I did keep the trim and design simple ...not much coloring and a lot of white around the image. I used a layout from Papertake challenge and colors from Just For Fun Challenge. Note: I was so excited that I won JFF's challenge last week. What are the chances to win again? I do love their challenges...check out the fun! Dexter is such a cute bear...he has a hug for you for dropping by! Sketch deadline is getting close for Beary Sweet Challenge 6 and this is my entry. 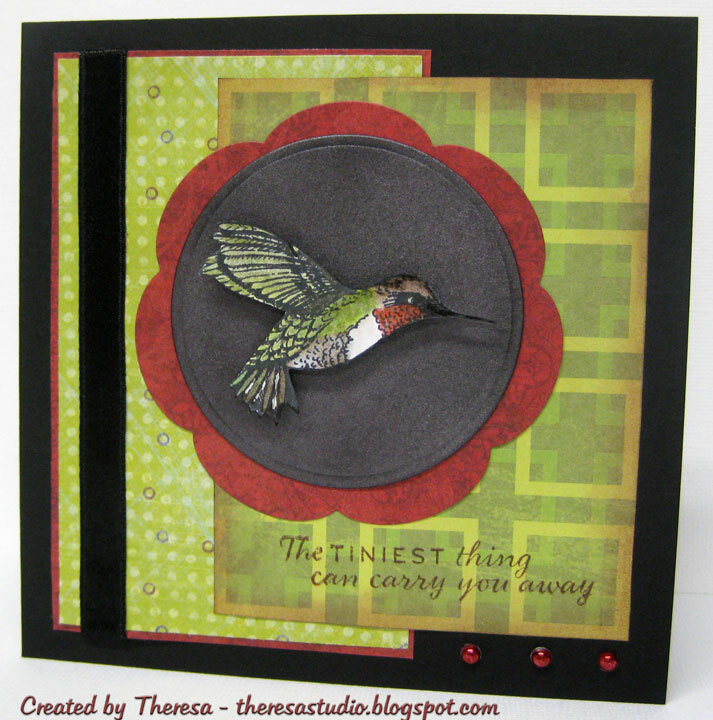 This card is kind of different for my style but I love this sketch and was anxious to use this hummingbird stamp from Flourishes. I really like the finished card...sort of dramatic with the colors I chose. 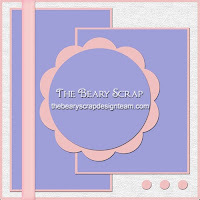 Also a different look for what I usually see in entries at The Beary Scrap. Speedy the Cat's Friends Challenge: Do masculine card. Paper Play Challenges: Anything goes. 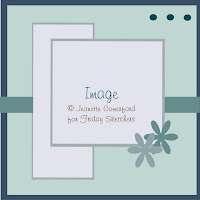 One Layer Wednesday Challenge is make a square card and use an outline stamp. I love these challenges ---they may seem very simple but it does take some thought and planning to execute. 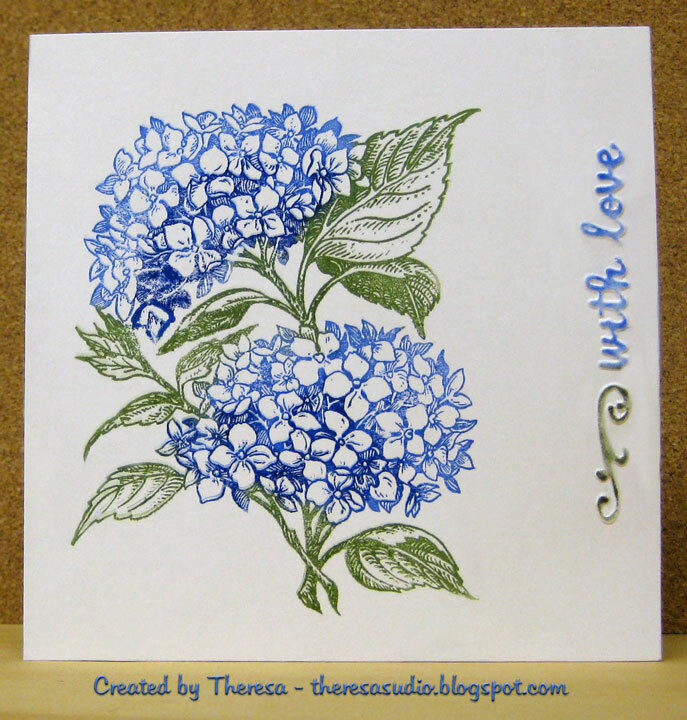 I inked up an old PSX stamp "Hydrangea" with markers and carefully place on the 5" square card. I do hope this is considered an outline stamp even if it has some details. I then embossed the sentiment along the side and inked the raised edges. 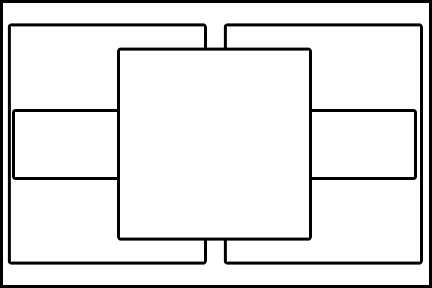 This card will also be entered into Theresa's challenge over at Stamp TV: to stamp an image sideways, upside down, or at a different angle than normal. 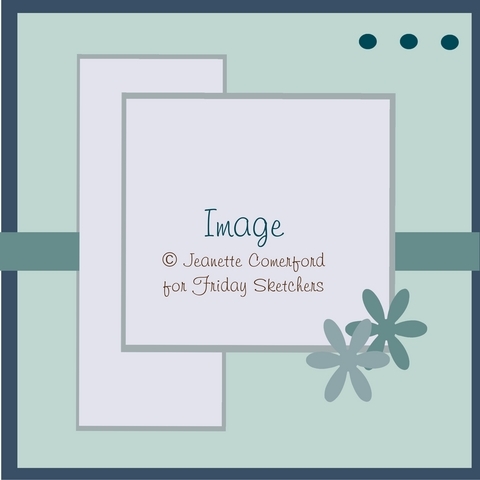 I do not make too many 5" square cards but this stamp looks best on a larger size than A2. Now I have to make an envelope. This card is for Friday Sketchers challenge. The sketch was provided by Jeanette and is shown on lower right. I had started this for another challenge but did the colors wrong but finished for this challenge. 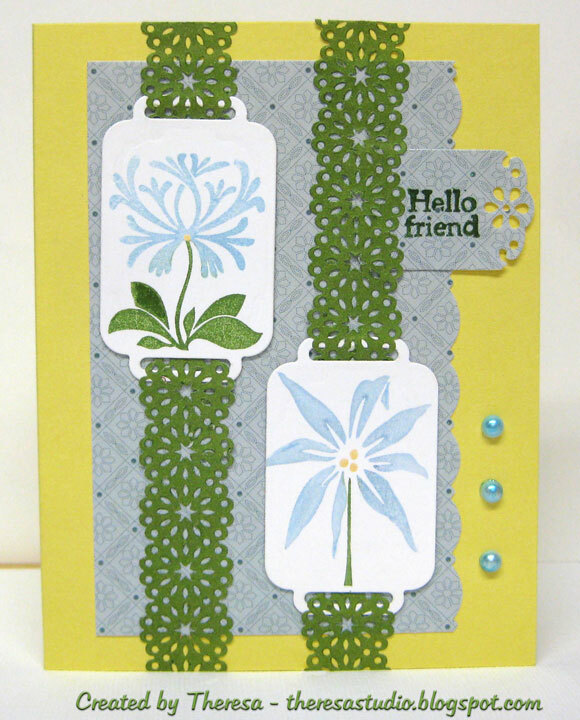 Stamps: GKD "A Year of Flowers" and "Botanicals"
Sometimes things go wrong but come out ok in the end. But then I forgot to post this card and may not have made the deadline at Friday Sketchers afer all. But I like the card and it was fun to do. A lot of the challenge blogs are thinking Christmas this week. I created this Christmas card for Giovana's Challenge on Stamp TV to do any shape you want, but not A2 size. 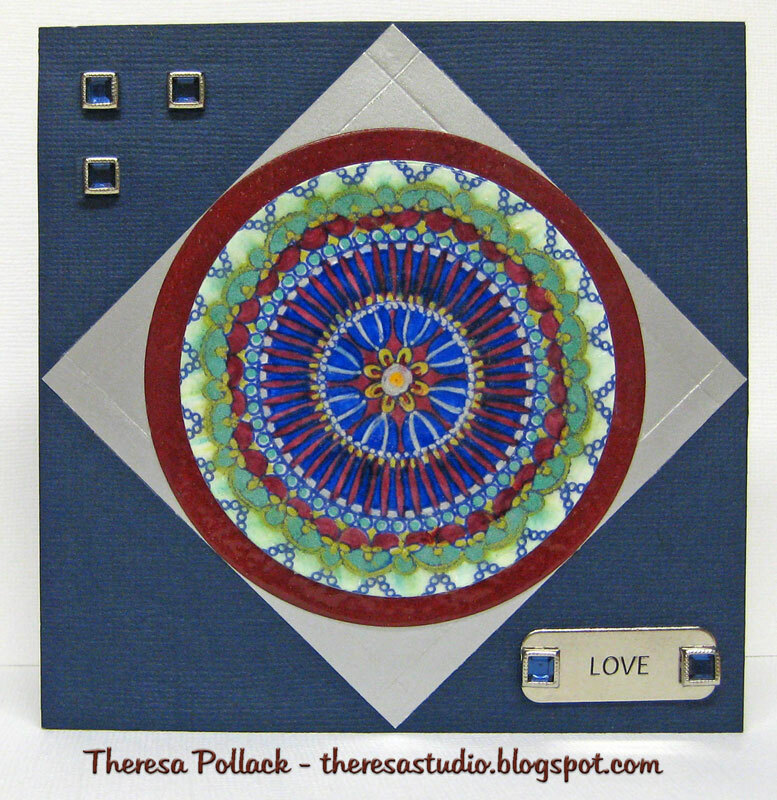 I made this circle card using a Fiskars cutter---one of my great garage sale finds. 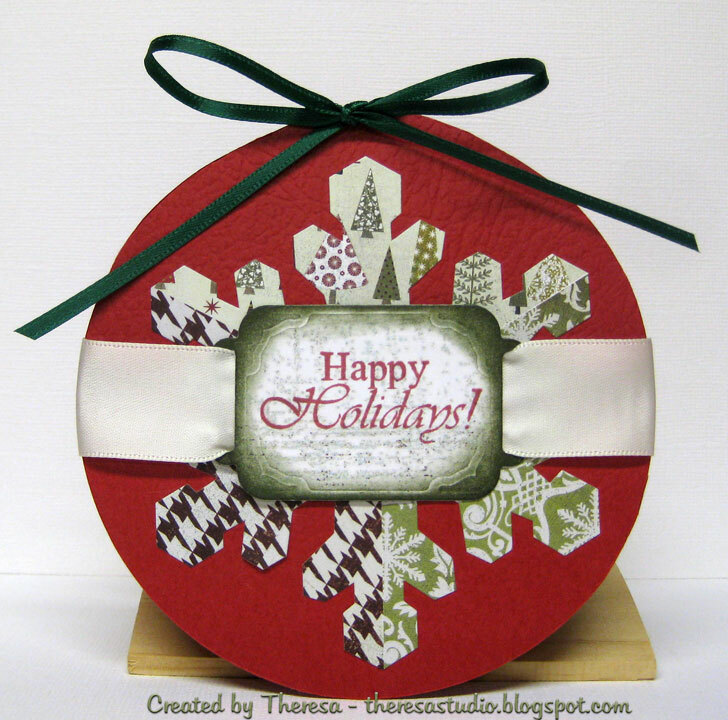 Added a precut patterned snowflake, a stamped and sponged tag die, and ribbons. How simple is that! Remember to fold card stock before cutting and leave uncut at the very top so you have a fold. 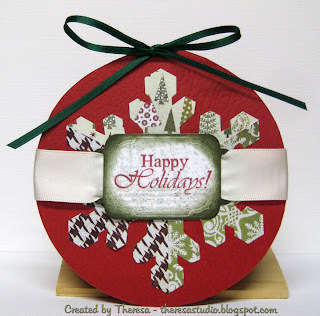 Stamp TV Christmas Challenge: Do a shape card. I will start this post by saying I really tried to get the yellow to look better in this photo but with no success. I used several tools on Photoshop Elements but still not a true color. Guess I am a glutton for punishment because this is the third card made with this Yellow CS and posted today! 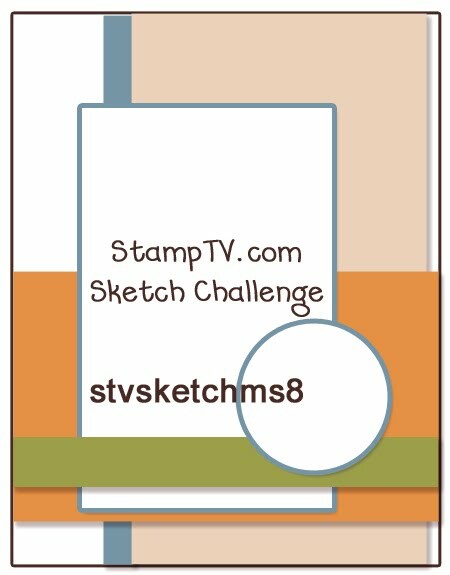 Anyway, I made this quick card for Linda's Stamp TV challenge and must get it in before the deadline. 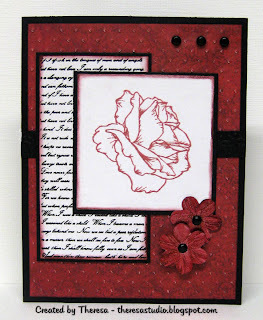 Her challenge was to use a Tag Die as a Decorative Element …and the “twist” is to use the FIRST Gina K Stamp set you purchased. I used these papers for no reason but I had them already out on my work desk. 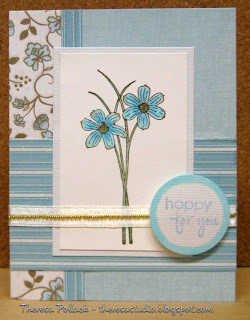 I inked 2 floral stamps with markers and stamped on card stock and the cut the images with a tag die. Slipped some adhesive paper ribbon through ends of tags and mounted to the mat and base card. 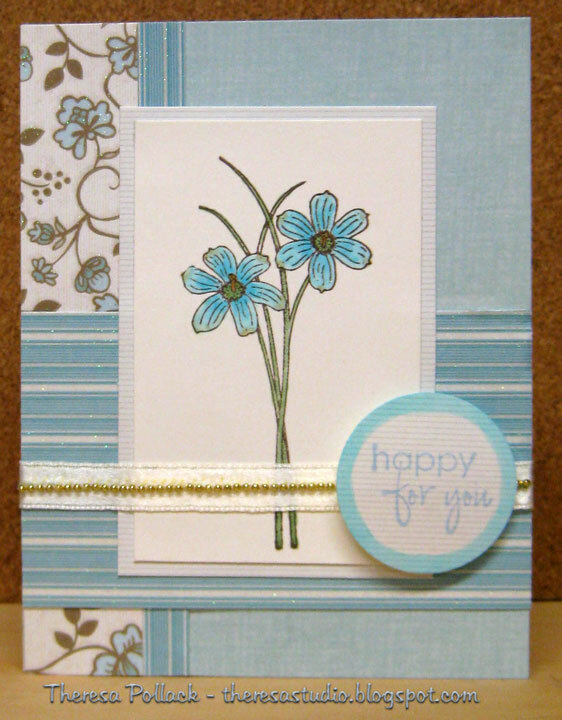 Added a little scrap of DP stamped with a sentiment and punched with border punch to match design in DP. Finished with Copic color pearls. Just had to use Copics in some way! May not ever use this yellow as a card base again...unless I find a better way to do photo. Last Post today....enough yellow is enough! An exciting new challenge blog is coming on September 5th for those who love rubber/clear stamping? The name is "Let's Ink It Up" and they are having great blog candy to kick it off. Check out their blog now and get in the drawing for their candy. This is my second post using the same layout and image but using a different DP and Trim. Used the LOTV image colored in the same way for this second card. 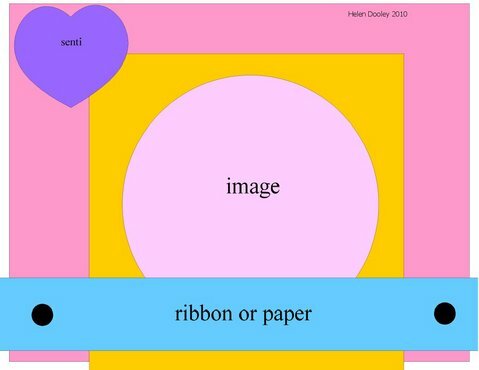 I liked this paper also and ended up making the 2 cards because I liked both looks. Added a sentiment that I printed on the computer. The note on the tag was hand written. 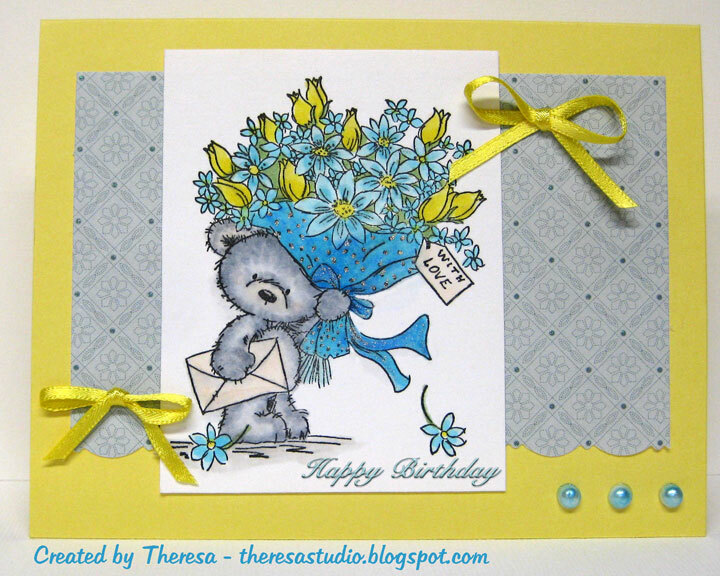 To see first card go here on my blog..
Just For Fun: Make a card/project using Gray, Yellow, Blue. Stamp Something: Make Something Flowery. Party Time Tuesdays: Anything Goes Birthday -with a sentiment on the front. Stamp: LOTV "Teddy with Bouquet"
If you have time, check out both cards and leave a comment which one you like best. I made this card for the Lili of the Valley Sketch Challenge shown to the right. Great sketch by Bev this week! I love this cute bear carrying a bouquet that I colored with Copics. Added the fabric brads and some pearls that I also colored with Copics. 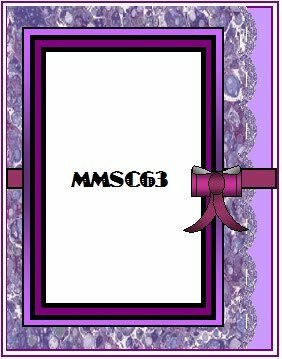 I also made another card with this same image and layout but used a different DP and and ribbon ...plan to post for other challenges. Will link together so you may compare the cards. My second card is here. I have a hard time photographing yellow cards...looks more green than in real life. If you have time check out the other card linked above, and let me know which you like the best. 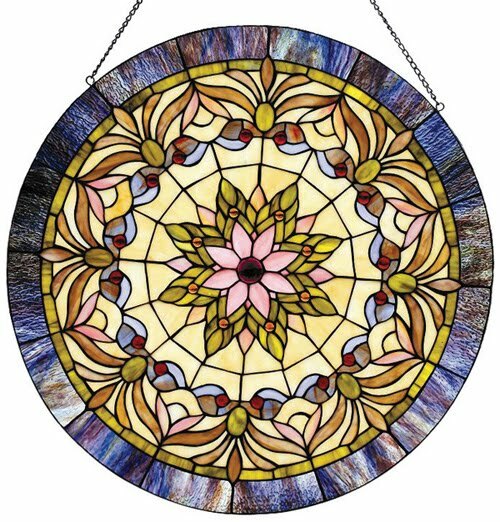 Brenda's inspiration challenge at Stamp TV this week was to be inspired by this beautiful stained glass decoration shown in the photo to the right and create a project. 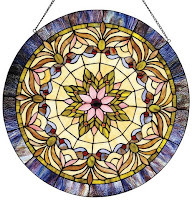 I decided to create a stained glass look using a doily stamp from Gina K designs. 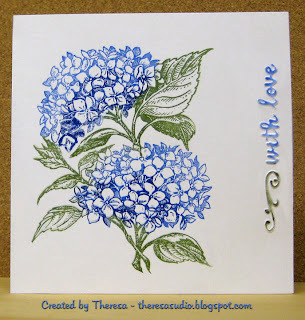 I stamped the design on white CS using a dark blue ink and colored using Copics, Markers, and Jelli Metallic pens. I then wiped the design with versamark and heat embossed. 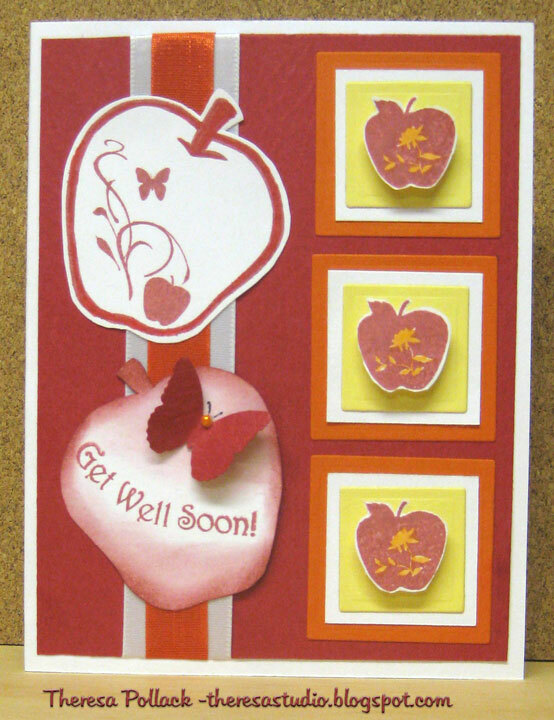 I cut out the image with a circle die and placed on a mat of red CS that I also covered with versamark and heat embossed. The photo does not show how lovely the glaze is on the image but it really shines in real life. Click on the photo to get a better look. I attached the design to a silver metallic CS and then to a base card of navy. Added 3 silver metal brads with blue glass stone and the metal sentiment plate attached with 2 more of the same brads. I made this card 5"x5" that seems just right for my design. I used a sketch from One Stop Craft Challenge that had a challenge to use metal with the sketch to which I also entered this card. 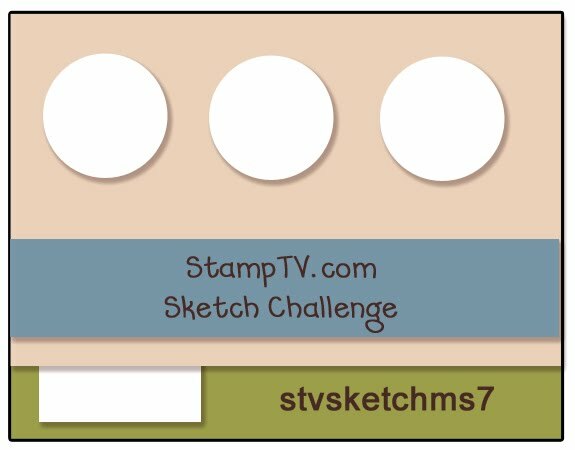 Melissa's sketch for her challenge at Stamp TV is shown below on the right. I decided to use blue and white with green in my card. blue and cream and a color of choice. Stamp Something: Use something flowery. 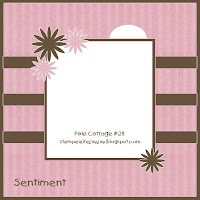 This can be flowery papers, flowery embellishments, an image of flowers, etc. I stamped the flower image and colored with copics and matted on a striped paper with glitter. Used a solid, glittered stripe and floral pattern for the other mats. Finished with a sentiment on a circle and a ribbon with gold beads. Was going to emboss the solid paper but forgot...too much in a hurry to finish? Guess it's ok without the Swiss Dots? 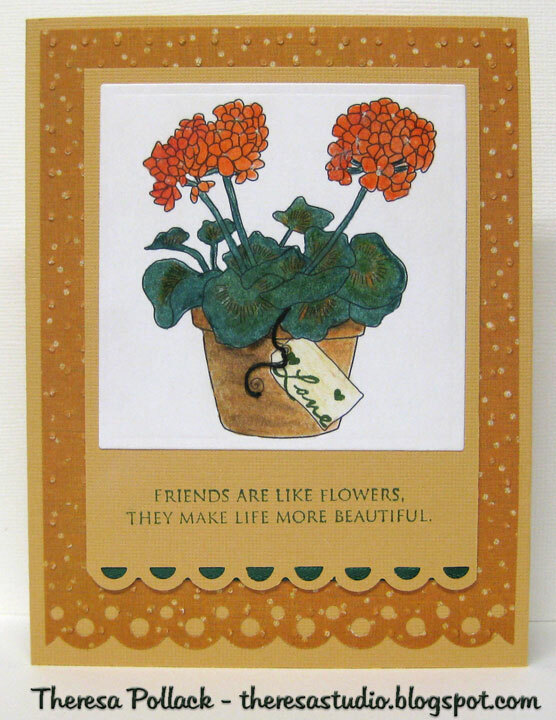 Stamps: GKD "Friends Are Forever" and "Botanicals"
Thanks for stopping by. I enjoy hearing your comments. 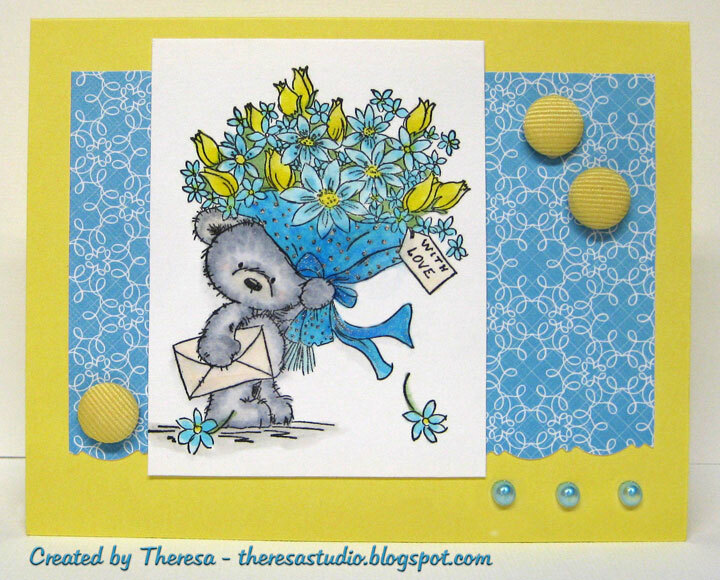 I just love the stamps from Flourishes.....won a gift certificate and of course I bought more than I had credit to spend! 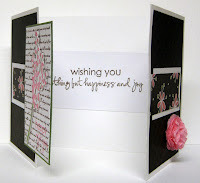 Flourishes has some great challenges and tutorials on their blog...go check them out. I made this card for the Timeless Tuesday Challenge with one of my wins. I used the sketch from For Fun Wednesday Challenge shown on lower right. 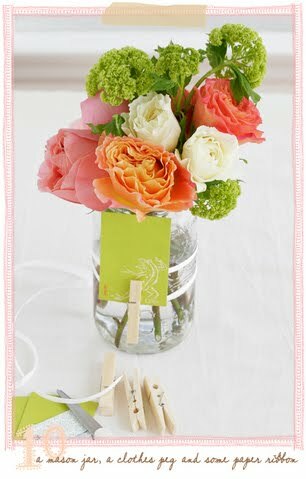 I used the colors orange, pink, lime green and white from the photo as my inspiration. I stamped the mums and colored with Copics, cut with circle die and assembled the card. 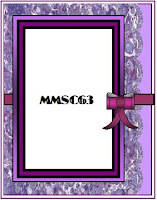 Hope you like my card. Had fun coloring with Copics. I have some mums starting to bloom...seems a bit early. 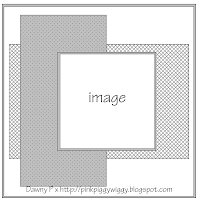 Isabella's Challenge: This week the challenge is to "Cut It Out". I cut out the image and attached with dimensionals. Really Reasonable Ribbon: Use ribbon dress photos shown on their blog for an inspiration. Anything goes for this challenge but must use ribbon. 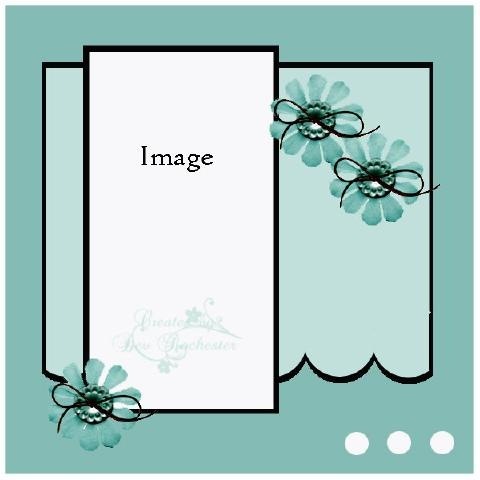 I was inspired to use this lovely dress image and add a ribbon bow to the back of dress. Also used ribbon across the scallop edged mat. Hard to see -same color as mat. Decided to not add sentiment until I send card. 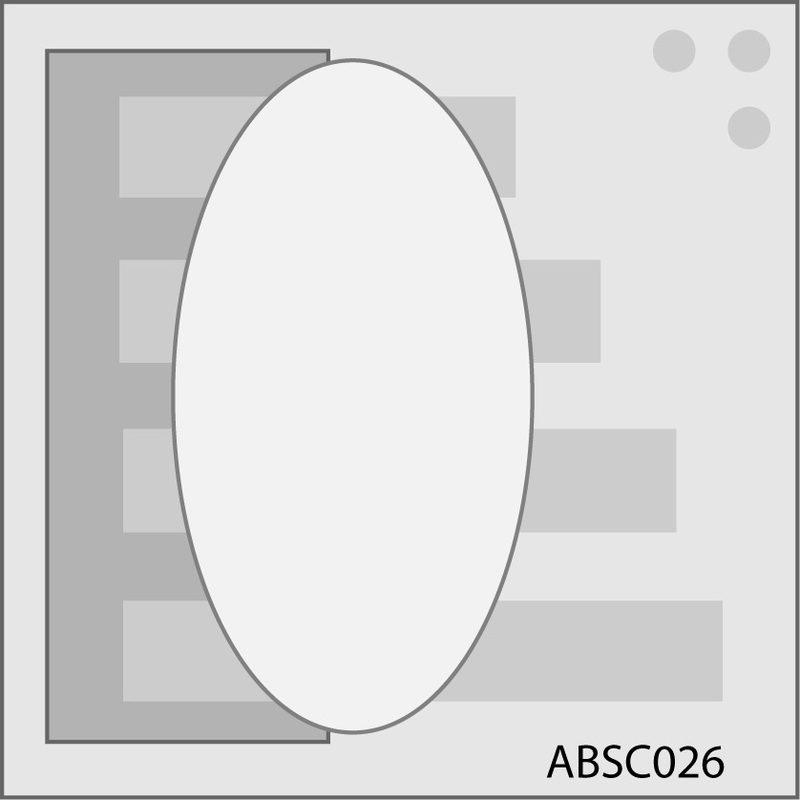 Simple card but does have 6 layers. Image: Isabella's Sketchbook "Garden Gift"
This is the second sketch that I have colored with copics....self-taught through reading and video watching and practice. The hardest part is to stay in the lines because ink flows so quickly. Need more practice to have lighter strokes. Glad that I have that colorless blender to push back the mistakes. Interesting how many Copics you can use in one image. Is that 3 embellies or 3 types embellies? 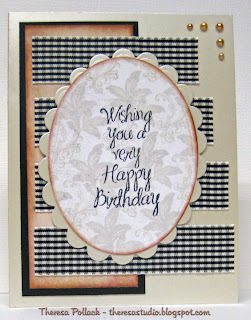 Going Grey with Scrap Creations: Challenge is to use at least 3 embellishments, and of course Basic Grey paper. Again, is that 3 embellies or 3 types embellies? 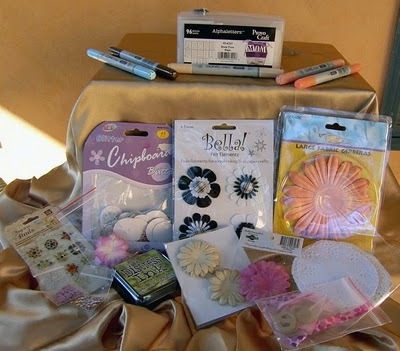 Limelight Papercrafts: Use their sketch shown to the right and try to incorporate some RHINESTONES or GEMS!! I like the sketch from Limelight but rhinestones did not fit into my MAN card. I printed the dog image and yes, I colored it with COPICS! I cut the image out with a circle die and edged with distress ink. I printed the sentiment on the computer using a digital sentiment from Raindrops Echo Designs, a freebie last week on Sentimental Sunday. I used 3 papers from Basic Grey for the layout- a stripe, a print, and a distressed solid. Played it safe and used 3 different types of embellishments. Added a bone ribbon and 3 brads. For the 3rd embellishment, I made my own bone cutting it out of brown CS and covering it with Matte Accents. Attached with pop up dots. 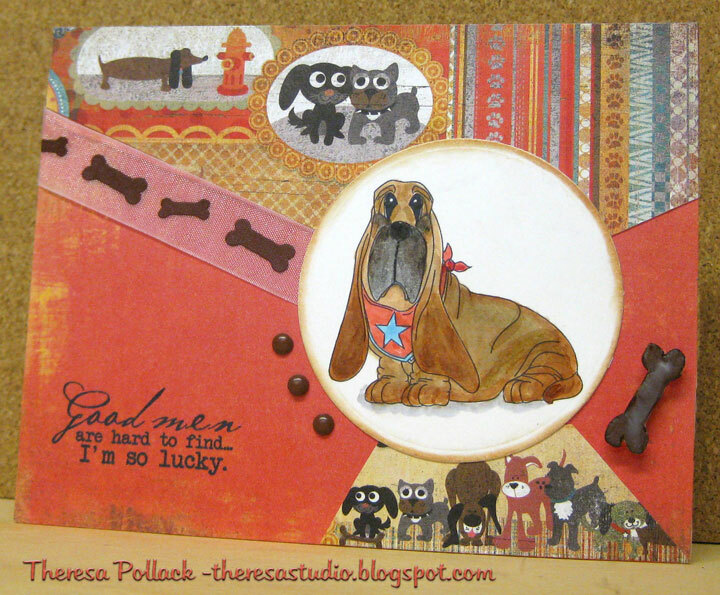 Isn' t this a dog gone cute card!! 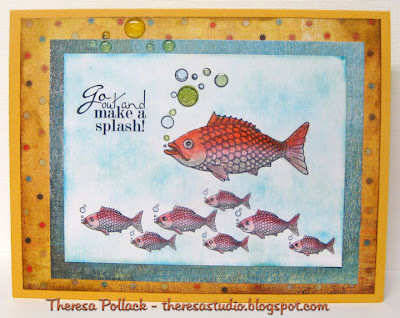 Stamp TV Color Challenge: Carla's challenge is to use aqua and red and if you need to add a little bit of an accent color or a neutral, go for it. This card may be stretching it for this challenge but colors are mostly red with aqua and rest are all neutral colors??? 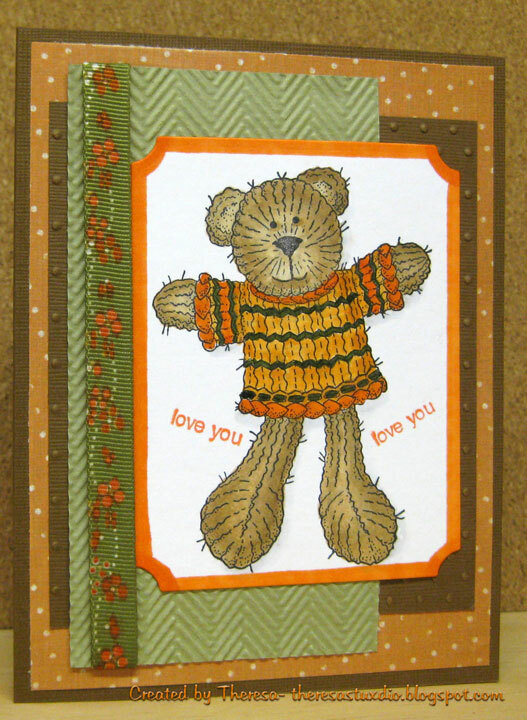 Speedy Cat's Friends Challenge: Claudine's challenge is to make a masculine card. Digital Image: Digital Doodle Shop Ragga Mutts "Stanley"
Papers: Basic Grey "Max & Whiskers"
My DH helped with the choice of papers and the choice of colors for the dog. He even searched out some photos of hounds for reference. I have never been around dogs that much but he had dogs as pets and even used to be in the dog food business . Let me know how you like my doggie. 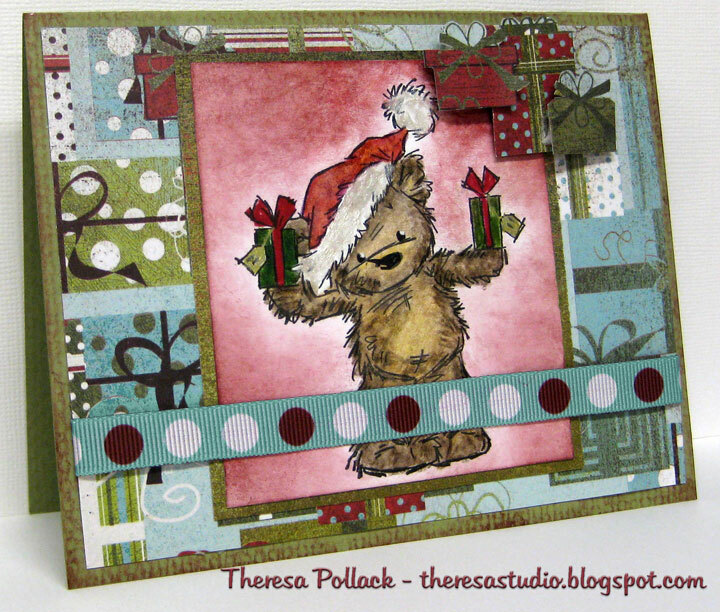 Christmas in July is the theme for Simplicity's One Layer Card Challenge. Rules: Use a single piece of card stock folded in half and the theme of your card must be Christmas/Hannukah/Kwanza/winter. Remember to keep embellishments to a minimum. 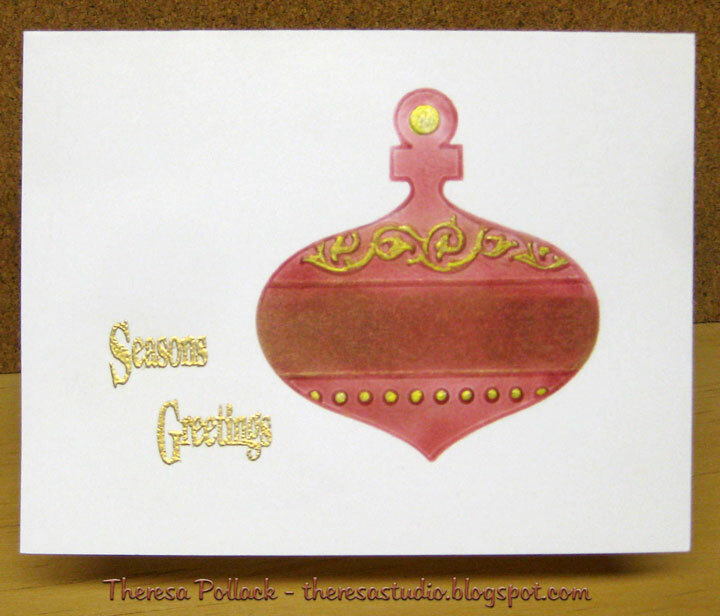 I used a CB EF to make this card....my plan was simply to emboss the ornament on the CS and color. But first I had to figure out how to emboss without the "For You" that is across the ornament folder. Once I figured that out and decided how to use the other side for embossing so I would have the raised area on the top side of the card, it was simple to complete. This folder also came with a cutting die so that I used it to make a mask for the ornament. I embossed the card and then covered the card with the mask so that I could sponge the ornament with color and gold. I highlighted the raised designs with a Gold Pen. Finished with a gold embossed sentiment. I do think I like the end results....rather elegant and only one layer. The ornament seems to pop off the card. Ink: Tim Holt Distress Ink "Aged Mahogany"
I am hurrying to post this for a deadline at Mark's Finest Papers and City Crafter's. Speedy the Cat's Friends Challenge #12 is to use hot colors of red, yellow and orange. 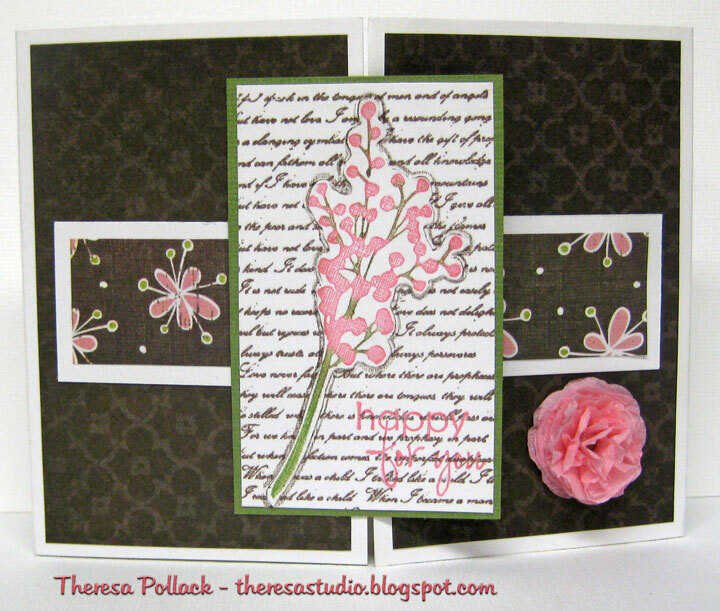 I combined this with a sketch challenge at City Crafter Challenge Blog shown to the right. I used the MFP stamp set that I won a few weeks ago and that was just released this week. I cut all my squares from scraps.I stamped the apples and cut them out. Attached small apples with pop up dots. Reversed one of the large apples that I stamped, sponged it, added a sentiment and a butterfly punched out of the textured red CS. Added a colored pearl to the butterfly. Click photo to enlarge to see details. I am not pleased with colors in photo but out of time. This week at There's Magic in the Air Nilla had a challenge to use the supplied image "Party Cake" by Paper Cupcakes in a project. I combined this with a layout by Jay Jay at The Pixie Cottage with the added option of "Double Up" to use two stamps on the card. I printed the digital image and colored it with Pencils and OMS and Glitter Pens. I cut this and matted on pink CS and inked all the edges with distress ink. I attached 3 bright ribbon stripes onto the base card of Oyster Pearl and assembled the card. 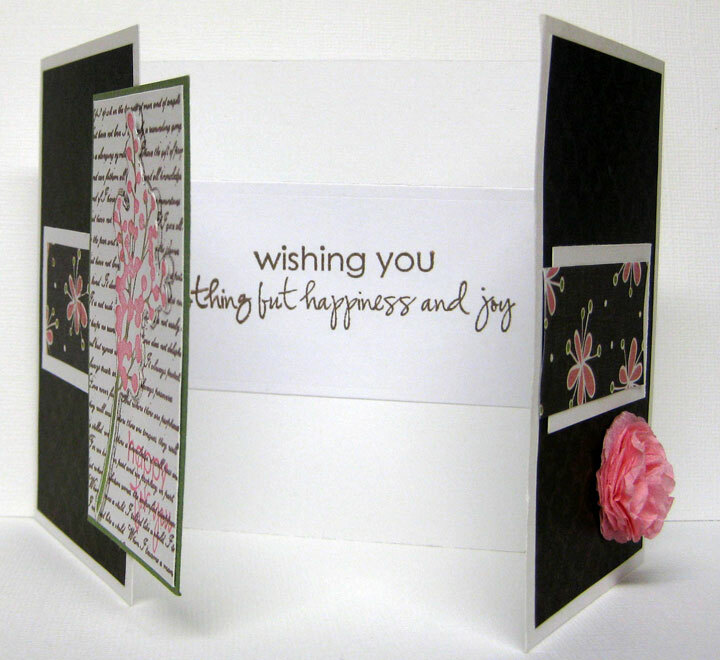 Added 2 flowers of crepe paper on paper flowers and stamped sentiment with Versamark and embossed with Gold EP. The Pixie Cottage: Sketch and "Double Up"
Joan's Garden: Do a birthday card using something bright and happy adding some kind of flower. Image: Paper Cupcakes "Party Cake"
Stamp: Creative Clear Stamps "Make a Wish"
Tim Holtz Distress Ink "Tye Dye"
There's Going to be a Party at There's Magic in the Air! Paper Cupcakes "Tea Party Sketch Blog Hop on August 11th - 18th. No need to RSVP- just be there for the fun, collect the sketches, and enjoy the projects. I have been trying to catch up with challenges...my goal is to be ahead of the game by being able to complete challenges shortly after they are posted and not be posting just before the deadlines. Easier to say than to do! 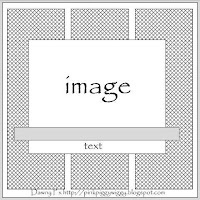 This project is for Basic Grey Challenge to use some Gingham on your creations and to include at least one item from Basic Grey on your creations if you wish to be in with a chance of winning the prize - $25 Credit. This closes tomorrow so must hurry! I used a sketch challenge from Annabelle Stamps shown below which actually is open for another week. Annabelle has some great new stamps released this week. Did the stair steps in layout with gingham ribbon. Added some distress ink at edges of mat and edges of stamped sentiment. Got to hurry and post! 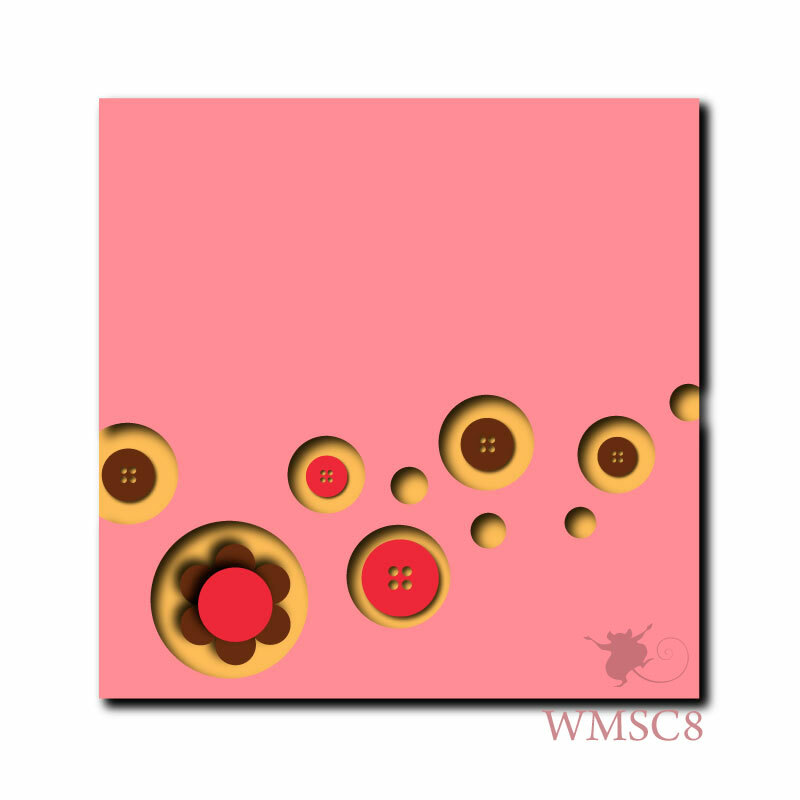 This card is for a challenge at Just For Fun to do colors of orange, yellow, and brown. I have not entered here before so am going to give it a try. 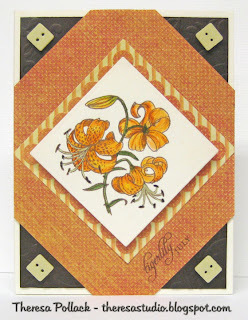 At first I thought of doing a fall card but then decided to use a new stamp of lilies...love how easily it stamps and the details. I color the Tiger Lily image using pencils and OMS and glitter pens. 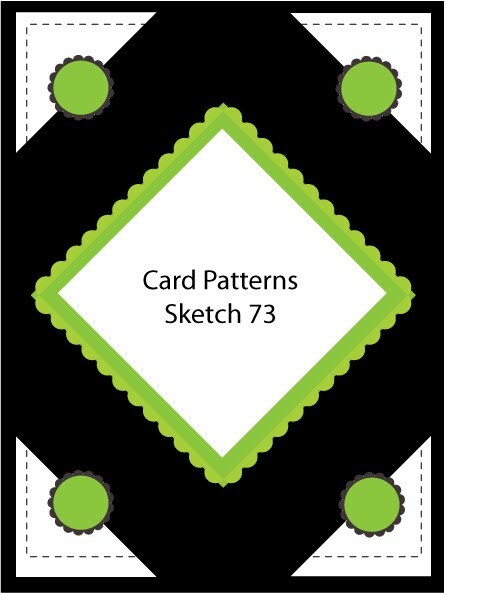 I used the layout from Card Patterns challenge....not that easy to do with all the angles. Used nesties to cut the pattern paper mats. 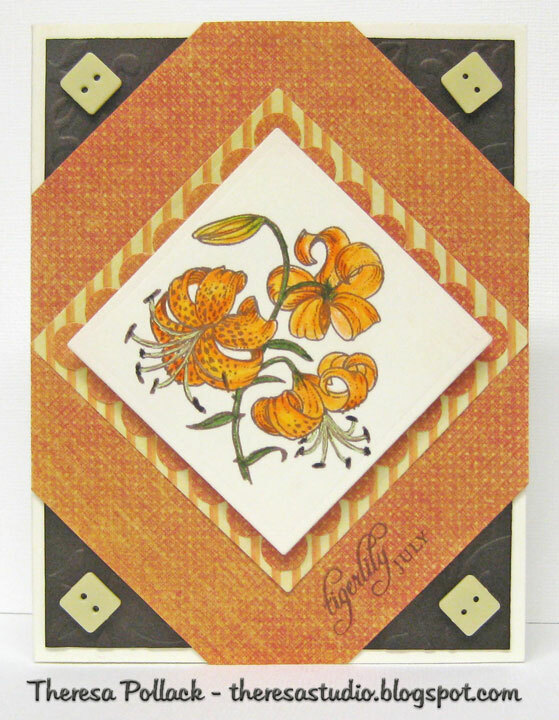 Used an Ivory card base and embossed a brown mat with EF on which I layered the image and mats. Added some yellow square buttons to finish. Stamps: Flourishes "Flowers for a Year"
Another hot day...did some gardening this am but spending afternoon inside. To be even hotter for the weekend. Third Post Today...got to meet those deadlines! I just love these cute Christmas Bears from Lili of the Valley. I do hope they will have more Christmas designs in their August Release. This guy is called "Little Star". This is similar to the card I posted earlier this week...liked it so much that I decided to make another one to enter in LOTV's sketch challenge. I colored the image with pencils and OMS, the star with a gold marker, and used gold marker for the edges. Distressed the edge of card base, mats, and sponged image with distress ink. For fun, I added some fur to his cap. Had this left from a coat I made for one of my bears. Very "Touchy Feely"
Sentiment: GKD "Very Merry Christmas"
Papers: Basic Grey "Figgy Pudding"
Ink: Tim Holtz Distress Ink "Aged Mahogany"
I think I have a good start with Christmas cards but have a way to go. 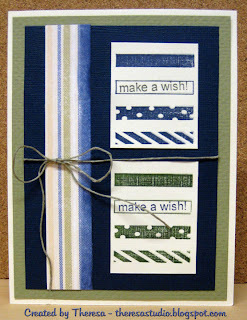 Linda 's Blast from the Past Challenge this week was to make a gate fold ...and the "twist" - to use only scraps! (with exception of your card base.) I decided to use the layout from Card Positioning Systems and made my card 5.5" wide by 4.25" high.. I used a white base card and mats of white under the scraps from K&Co in a brown damask pattern and a brown with a pink flower design. I like these 2 patterns together. To carry out the colors, I stamped a script background in brown and layered on a green mat, another scrap for the center of card. 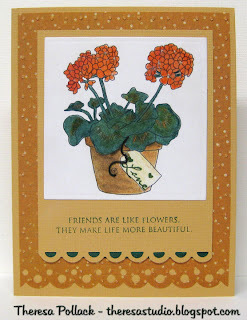 I used a flower stamp that I inked in pink and green and cut out the image edging it in brown ink. Layered this on the script and assembled the card. Finished with a crepe paper flower that is easy to do. (See Video on Selma's Blog here.) Flower is held together with a brad. Used a piece of Velcro (another scrap) to hold card close...easy to open. Finished with sentiment shown in photo. Stamp TV : Make a Gate fold card. Hope Selma does not mind my sharing her video. She also has a great video for Vellum Flowers. At Stamp TV, Giovana's Christmas challenge is to use Embossing (dry/ heat or both) + Pink!! 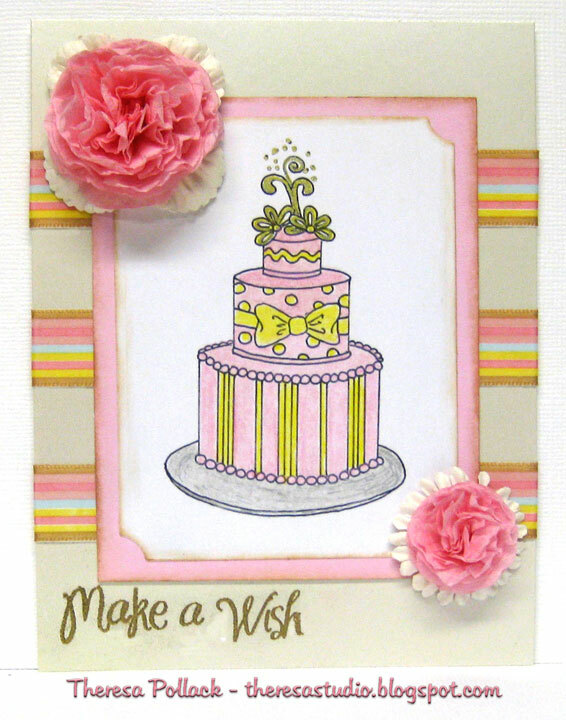 I started with a base card of pink and layered with an ivory mat embossed with a CB Ef. I added organza ribbon to this. 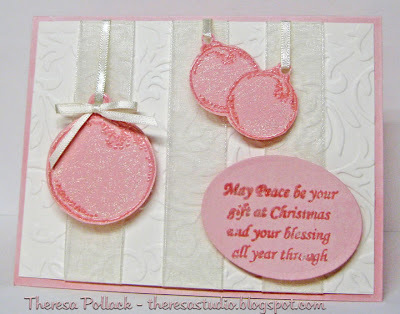 I stamped Christmas ornaments on pink CS and embossed the design with white EP. Added some glitter to them. Also stamped a sentiment and embossed in the same way. Cut out the ornaments and "hung" with satin ribbons and attached with popup dots. 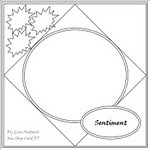 Cut the sentiment with oval die and added with popup dots too. 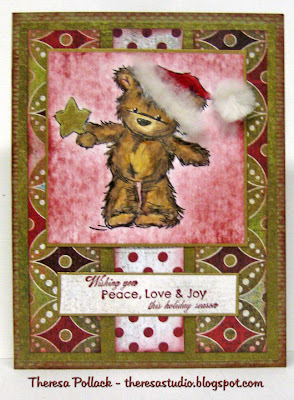 Made this card for Just Cute Bears Challenge which is "Christmas in July". 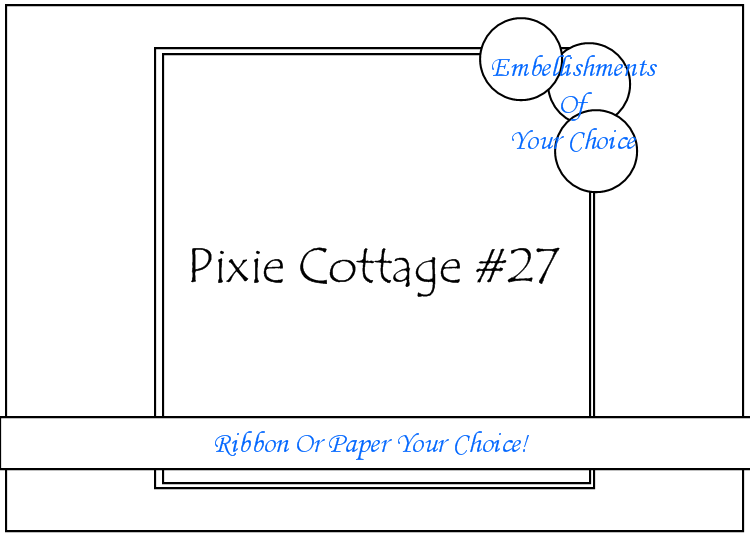 Also found a new (new to me) challenge blog...Pixie Cottage and combined it with JCBC card. 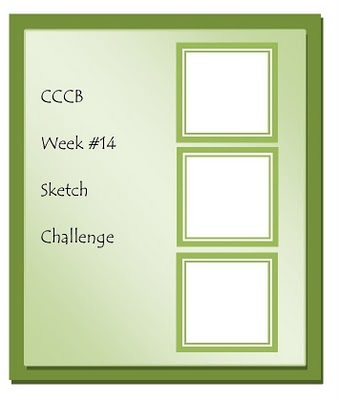 They have a sketch challenge this week with an added option "Triple Play" which means use something on your project 3 times! That means 3 flowers, 3 designer papers, 3 ribbons, 3 embossing folders, 3 buttons, anything as long as it's a trio! I was going to do just the sketch without the option but then I added 3 Boxes of patterned pattern cutouts in the corner so that's my "Triple Play". 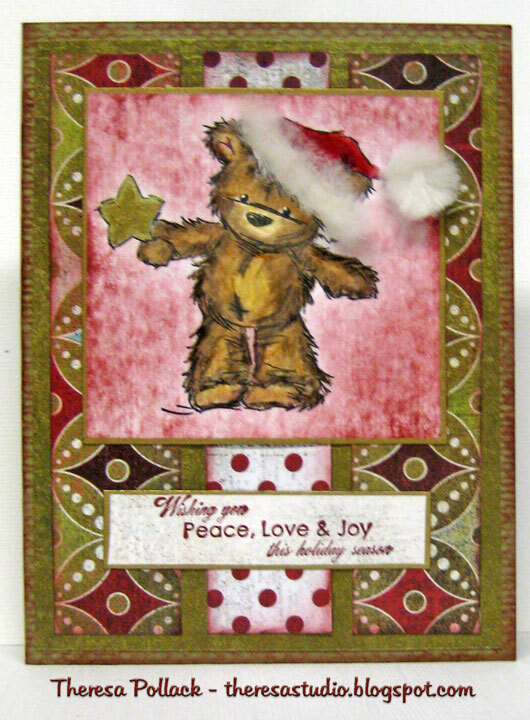 Used the Bear Stamped from LOTV on white CS that I colored with pencils and OMS, added stickles to the hat, colored gifts with markers, and then sponged the background with distress ink. Love how the coloring came out. Placed this on a mat of distressed paper. Used a background of pattern paper, added a ribbon, and attached to a solid base card that I distressed edges with the ink. Had a hard time deciding on the ribbon...first thought was to use solid but then decided the dotted ribbon picked up the dots and colors in the paper so went that direction. Finally I cut 3 box designs from the patterned paper and attached with pop up dots. 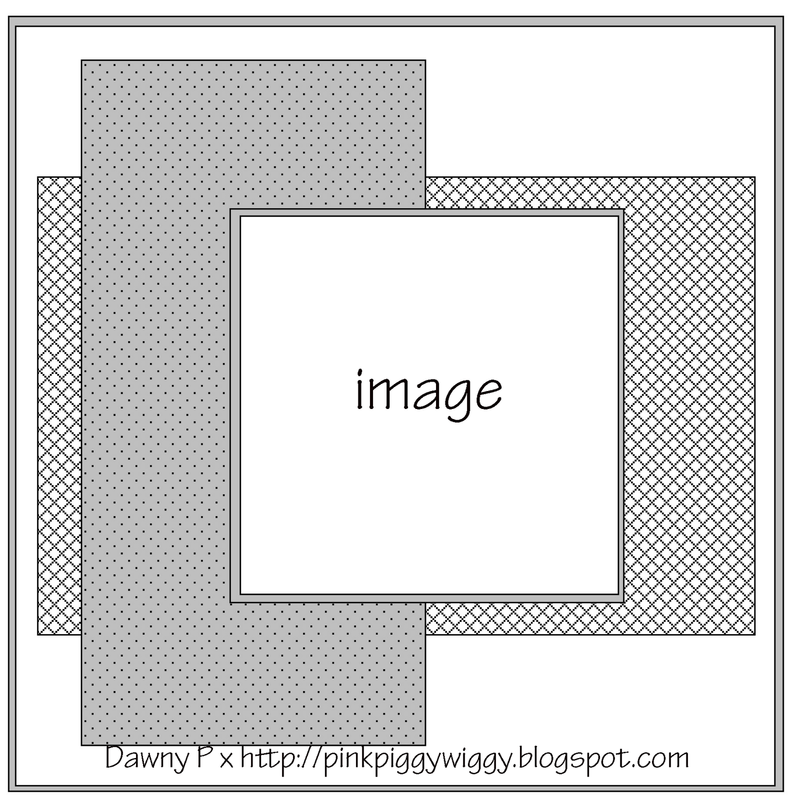 Stamp Image: Lili of the Valley " Presents for 2"
Papers: Basic Grey Patterns from "Figgy Pudding"
This week's Challenge at Isabella's is to use a punch, any punch with an Isabella image of course. As you may know I just love Isabella's digis and I love to enter her challenges and love to win her digis. This week I colored the Geraniums Image with pencils and OMS and used a sand color mat that I punched with scallops and lined edge with green ribbon and layered this on a pattern paper that I embossed and punched the edge with yet another punch. Wish I had not embossed the mat...did not add anything to the dotted paper. I assembled this on to base card of sand. Added some twine to the tag. Simple enough card...could have added more but sometimes less is better? 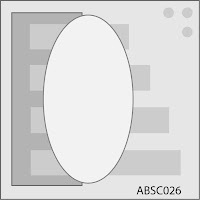 Big sale at Isabella's Sketchbook this Wednesday, July 21 ... all digi stamps will be $2.00! I have my order ready to go. ( Shhhh! Don't tell my DH!) Put it on your calendar! Go and Make a Splash! 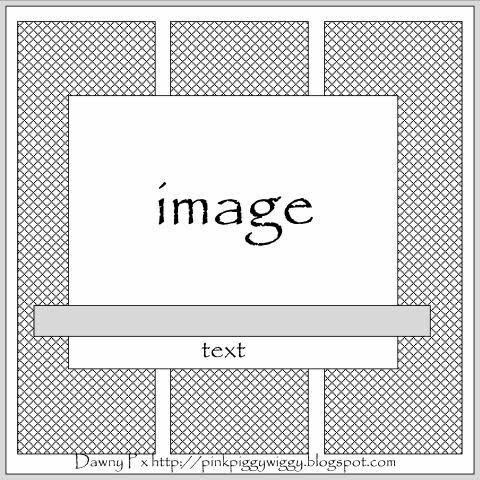 I have found a wonderful blog, Create with TLC where Paulette creates such great Word Art that can be used for Digi Scrapping or Digi Stamping and wonderful digi images. Paulette says, " Have a digi addiction? This is the place for you." I am amazed by her work!!! Do check out her blog and store. She has a challenge today....you can download a School of Fish or the individual Fish or both for free. Use them in a project, post the project on her blog using the inlinkz button and be entered to win a $6.00 Gift Certificate to her Store. But work quick because her challenges do not stay open long. 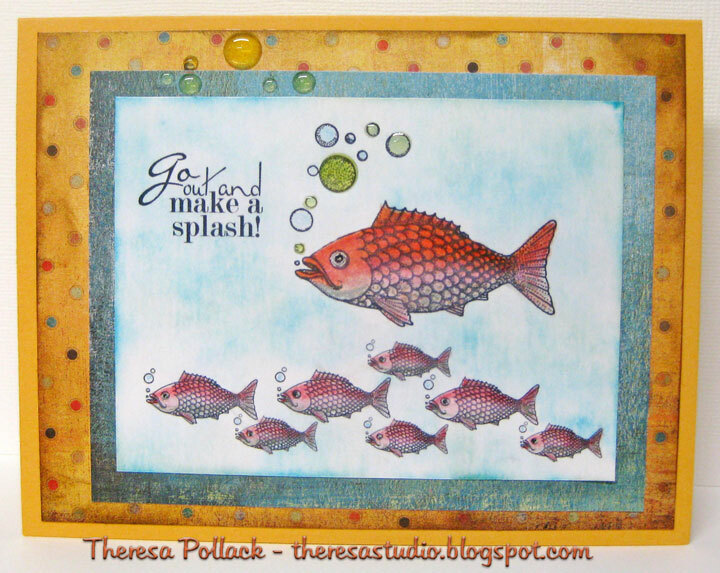 I made this card using School of Fish, Large Fish and a sentiment all downloaded from Create with TLC which I printed on white cardstock and colored with pencils and OMS and sponged with SU inks. 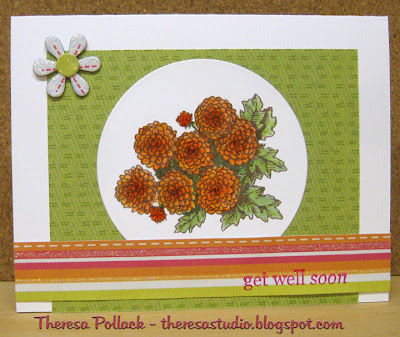 I used Basic Grey pattern papers from Max and Whiskers Matstack and a base card of SU Marigold Morning. Added some vinvl dots to highlight the bubbles and some glitter to the fish. This will be a card to send my nephew who is graduating with his Master's Degree in Business this month. Go have some fun at Create with TLC. Button, button, who's got the button? 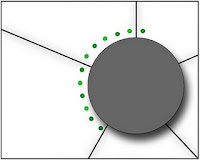 Or where is my Circle Die? I know this is kind of a plain card and I had something else planned but could not find the circle die that I needed to cut circles the right size....MIA from my nesties. After I killed so much time looking everywhere for that piece of metal, I decided to do something quick but then it took forever for me to find the right size and select the buttons. 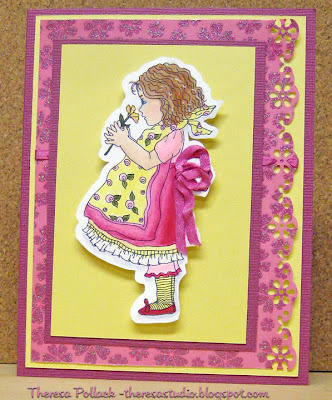 Should of gone on to another project but was determined to use this sketch from Stamp TV Sketch challenge from Melissa. May not win any "stamping" awards but does fit the sketch. Ha! Does look very masculine with the 3 buttons that have character more so irl. 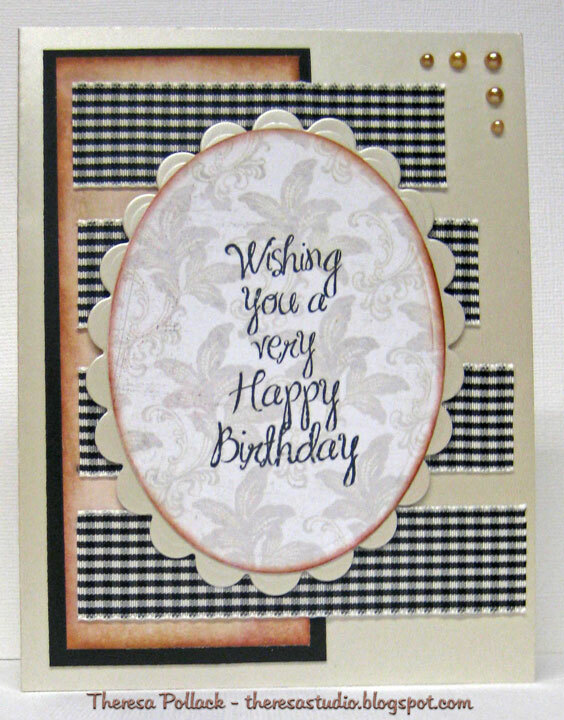 Used ivory base card and a mat of striped paper from the Cappella matstack. 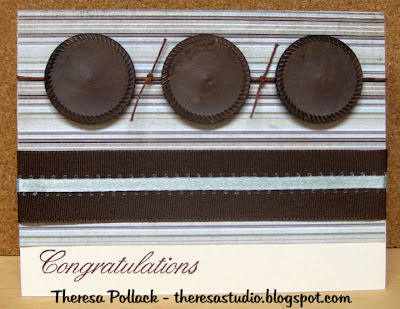 Used brown grosgrain ribbon layered with an aqua satin loop ribbon as a stripe. Brown twine is ran through buttons (hard to see) and added some ties between the buttons to finish. Stamped an appropriate sentiment in bottom corner. Not too happy with this but congrats to me for finishing! Crazy 4 Challenges: Use buttons.